At Martin Custom Woodworking and Antique Restoration, providing highly-skilled, high-quality antique wooden furniture restoration is a three-generation family tradition. Curtis Martin is a 3rd generation craftsman who began woodworking in his father's shop when he was only ten years old. He spent the formative years of his life amongst the sawdust of the Furniture business that has since become his lifelong passion. Mr. Martin graduated from NC State University's Furniture Manufacturing and Management program, ready to apply the latest skills and techniques in creating and restoring furniture to the proud family tradition of woodworking that started with his grandfather in the 1800s. (1886-1955) Edward Tibbles served as a workshop apprentice in England in the 1800s. Mr. Tibbles came to America. He worked for a time refinishing railroad cars before moving to Dayton, Ohio, where he started crafting exquisite trimmings for luxury cars. Edward went to work in the Stoddard Dayton Co . putting varnish on wooden automotive side panels and doors. For those of you who are unfamiliar, Stoddard-Dayton was a high quality American car manufacturer in Dayton, Ohio between 1904 and 1913. Their entry-level vehicles were given 15 to 18 coats of paint, while the limousine models featured nearly 30. Each coat of paint was meticulously hand-sanded! Mr. Tibbles also restored and refinished pianos. After years of acquiring and perfecting his craft skills he opened his own shop in Dayton in the 1920s. A young man by the name of J.C. Martin married Mr. Tibbles' daughter and joined the family business after leaving military service. With this, J.C. Martin became the second generation of gifted furniture craftsman in the lineage. When Mr. Tibbles died in 1955, J.C. Martin moved the business south to Greensboro, NC and his grandson Curtis Martin began learning the family craft. After graduating with a degree from NC State University (1984) and a stint working for a major furniture manufacturer, Curtis Martin opened his own shop in Wilmington, NC with his wife Carol in April 1998, and has since spent his time there watching both his business and his family grow to something he can be extremely proud of. After a number of years, Curtis's son Jake (4th Generation) joined the family business and today is the shop foreman. The business recently located from Northchase Parkway Business Park to 2149 Wrightsville Avenue---a move made to better serve our customers and to further plant roots for its future in the quaint Wrightsville Avenue Corridor. From its beginnings as a rural road between Wilmington and Wrightsville Beach to the corridor we see today, Wrightsville Avenue continues to be an important part of our local heritage and a source of community pride. When asked about the secrets of his success, Curtis points to his core values as an expert craftsman: excellent workmanship and attentive customer service - values he learned from a three-generation family history of providing clients with high-quality craftsmanship and wood furniture. 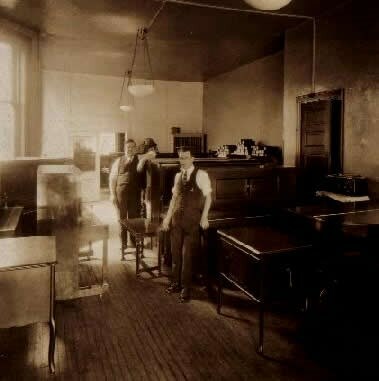 Edward Tibbles (on the right, above) stands in his furniture refinishing shop in Dayton, Ohio, in this photograph circa the 1920s. His grandson Curtis Martin carries on the family tradition of craft woodwork with his company, Martin Custom Woodworking and Antique Refinishing . Incorporated name MCW Enterprises, Inc.
American Institute for Conservation of Historic Artistic Works The AIC is the national membership organization supporting conservation professionals in preserving cultural heritage by establishing and upholding professional standards, promoting research and publications, providing educational opportunities, and fostering the exchange of knowledge among conservators, allied professionals, and the public. Claims Prevention and Procedure Council The CPPC is an organization of claims professionals in the moving and storage industry, and allied service providers such as furniture repair professionals, appraisers, adjusters, attorneys, etc. National Furniture Repair Hot Line The Hot Line is a nationwide referral service linking companies in need to highly qualified furniture repair and restoration professionals.